My dad sent me a link to quibids.com, an online auction site that allows you to buy items by bidding on them. Sounds familiar? The twist is that this site is a type of penny auction site where each bid costs money. A second catch is the auction has no set time limit. It has a count-down timer but it adds on 10 seconds each time someone bids. It’s great to see a live auction because I always imagine the disappointment had by the winning bidder as the time goes 4…3…2…1…………….14….13 (with a new winning bidder). Anyway, this place makes a load of cash on the simplest of items: gift cards. Here is a completed auction for a $50 Outback Gift Card. This deceptive webpage puts the savings at $18.10 for a $50 dollar card. 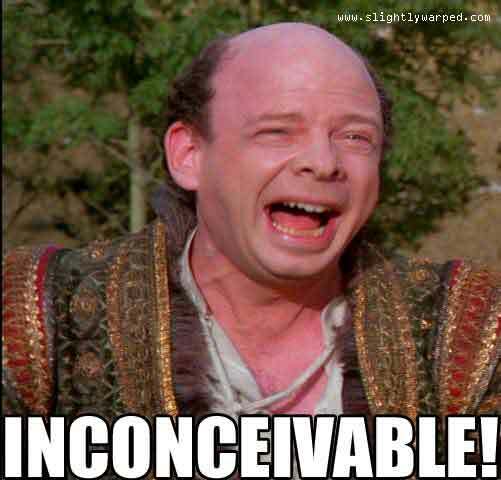 Inconceivable! The Consumer math kids broke down the cost to “saltyfish13”. 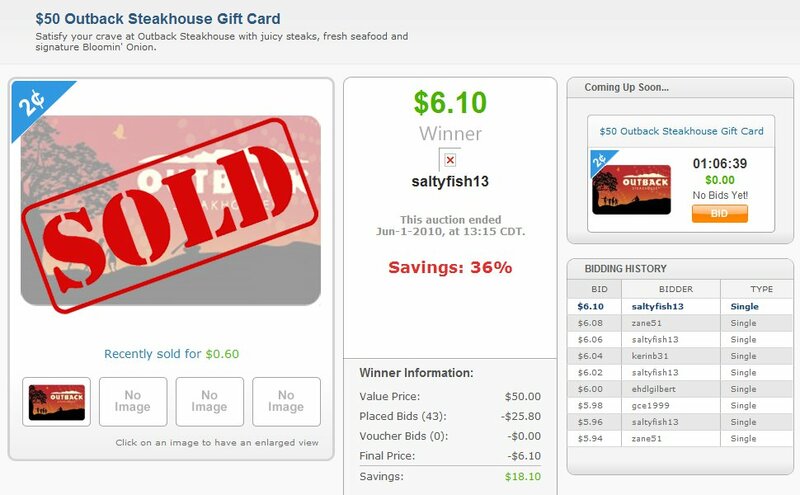 Saltyfish13 made 43 bids and eventually paid $6.10 for the card. A hidden fact regarding the bids, is that while the bids go up by 2 cents at a time, we assume that they must cost 2 cents. However each bid is 60 cents! So saltyfish paid $25.80 for the bids and $6.10 for the card, $31.90 overall. How does this company make money if they are giving money away on each bid?? Well even the losers to the auction pay 60 cents per bid. Since this auction went up by 2 cents at a time, there were 305 bids. The revenue for this bid is $183 plus the $6.10 for a total of $189.10 on a $50 gift card!! Wow that’s a nice profit! We went on to talk about how there are plenty of auctions where they may lose a bit of money, but how that is certainly outweighed by the massive profits of a couple of random auctions. They picked up on the idea that the person feeling the worst must be zane51, the second-to-last person to bid on the card. Who knows how many times this person has bid to try to win this $50 card. The students went online in pairs to find 3 types of auctions, one big profit, one break even, and one loss. I hope to continue these type of lessons to give the students a shot at not being ripped off nearly as much as many. My favorite part of the day was when somebody described it as a game of musical chairs, where everyone pays a fee for each round that they stay in and the final person keeps the prize. I couldn’t have (and didn’t) described it better. Hello Mr. Anderson. My name is Jill and I work for QuiBids. I’m sorry you feel that way towards us. There is no secret or “catch” to our site. It is a ‘pay to play’ business model. We provide our customers with great deals, along with a fun and exciting online experience. No user has to walk away empty-handed. This is where we offer the Buy It Now feature. If a person loses an auction, he/she can choose this feature and apply his/her bids he/she used in that auction towards the retail price of the product. They then make up the difference and we send them their product. That way, they won’t be out any bids/money. Buy It Now is a safeguard we provide for our customers. On another note, we lose on almost half of our auctions, and people save up to 95% on our site every single day. Feel free to contact us at support@quibids.com if you don’t fully understand the model or if you have any other comments. We’re happy to help! Thanks for the response. The “catch” that the website provides comes from the deception of just showing how much the winner spent, and not how much money the losers spent on the auction. Also the “Buy it Now” price is often hilarious inflated. For instance, on the frontpage of quibids.com right now, there is an Apple iPad 16gb wifi with a “buy it now” price of $730.00. Doesn’t that go for $499 everywhere else? How is that a safeguard? Lastly you may lose on half your auctions, but that clearly doesn’t tell us anything. If I lose 50% of my auctions and I lose a $1, but on the wins, I gain $50, how does that accurately represent the data? I understand that any company has a right to a profit, but my class feels like your route to the profit is deceptive and tricky. Just FYI. Dan you have a point and don’t let quibids paint you in a corner. While the offer Buy It Now the retail price is jacked up as well as a hefty shipping charge. It’s a chumps game and they are all rip-offs so you did a good service by calling quibids.com out on this. There is no formula because you have no idea when the auction might end. If you say I’ll only spend $1 to win a $100 gift certificate, it could take you 1000 attempts to win it, or 1 attempt to win it. My guess is that you’ll (on average) spend far more than $100 in bids to get that gift certificate. Otherwise, why in the world would quibids sell them? Dan, you’re awesome. was about to become a hapless victim of underground deciept. Can’t afford it. Thanks. First, their “values” are not realistic. For example, right now they are offering an iPad, 64GB, WiFi. Value price is $899 plus $16 shipping. The same item on Amazon is $773 plus shipping. But the reason I am here is to present a short formula that I think tells one when to bid and when not to bid. That’s not a typo. When the Projected Price for an item is less than you are willing to pay, then you should bid. It does happen, but not for the interesting merchandise. And they have gotten another 200 bids since I started writing this. What a great racket! Sorry, that’s 1 in 54 odds if you add your bid. My bad. Also, with 53 bidders, there are probably a few who are not in control of themselves, so your actual odds are probably worse. There is no difference if there are 53 other bidders, 54 total bidders, or 1 other bidder. That is the price/cost if you win on the first bid at the $32.63 price. Agreed. “If” you are lucky then you’ll win and get the item for less than the cost. But you’d have to be very lucky. quibids.com is essentially a lottery, where many people lose money, and one person (and only one person) gains. And quibids.com wins nearly every time. Don’t be a sucker. That’s very true but, at all those unlucky bidders spent in trying to win the item at sixty cents per bid when the price only goes up .02 cents per bid. This is how QuiBids makes their tremendous profits on an item. It is true that someone will win the auction for a good price. But QuiBids makes their fantastic profits from the looser’s bids. Actually, I think I have come up with a more accurate formula. Suppose you want to buy an iPad that is listed for $699 on Amazon (free shipping with Amazon Prime). You look on QuiBids and the bidding is at $50. So you bid 100 times at 60 cents per bid. Thats $60. You don’t win that auction and you give up because you can’t stay up all night. Then you do the same thing on the next night. And the next. And the next. You do this 10 nights. That’s $600. Then you give up and order from Amazon and pay $699. Your iPad has now cost $1299. Now, if you had just ordered from Amazon in the first place, you’d have only paid the $699. Therefore the formula for the number of bids you should place on QuiBids to get the best price on any product is “C” (the cost of the product) times “P” (the number of people bidding) times zero (the likelihood that you’ll win the bid before giving up). C*P*0 = 0. The result is approximately zero bids. If it sounds to good to be true, it’s too good to be true!! Buyer beware and always do your research and read feedback. I’ll stick with eBay thanks! Stay away from this site. Save your money and time. They are making tons of money. Research relays 100 employees work for them. Why would this be needed? You really do PAY BIG TO PLAY. PLAYERS BEWARE!! great page, spot on answers, good advice. we only recently got the quibids tv ads here in australia and i smelled a rat almost immediately. I bought a camera through Quibids and when I did the math’s, my $9 camera actually cost me $149 with postage, the same camera I could have bought from my local camera shop or through another online site for less than $100. Lesson learned, never again. This is typical of replies. Ignorance all around. QuiBids is what it is. Don’t play if you don’t know what you’re getting into. Of course they make money…it’s a business. I’ll bet everyone one of you that replied works for a business that makes money. This one plays more on the ignorance of it’s customers, but why attack the business? They tell you up front the rules and they don’t hide anything. If a customer feels like they got ripped off, I say it is there own fault. So information about the business practices is bad and shouldn’t be given? Very disappointed in this site! The remaining time seems to be set for Quibids and not for the bidder. Any other auction site I have accessed has given value for money and Quibids is a complete RIPOFF! My advice is stay away! some people have more dollars than sense.look before you leap. Looks like they are taking the money off your credit card and they are not giving you a refund! Mark is right, STAY AWAY FROM QUIBIDS. I CHECKED THE SITE MYSELF AFTER BEING SUCKED IN BY A “FREE” BID POINTS OFFER. Next thing I know there’s a charge on my credit card statement for $60. I’m not amused. I didn’t buy anything or do I intend too. Tried calling their customer service # but of course it wasn’t working (Aug 18). Now I notice I can’t even go to their site without agreeing to their” new updated terms and conditions” whatever they may be. So I contacted them by email and haven’t received a response. As far as I’m concerned this site shouldn’t be in business. They are real scammers. Try this. Select a item, note the bidders and current bid price for the item selected. You will also find related or same price item on the top. Select any of the other item from the top. You will find same bidders, same the bid price but the product name, picture, statistics changes… how come so. 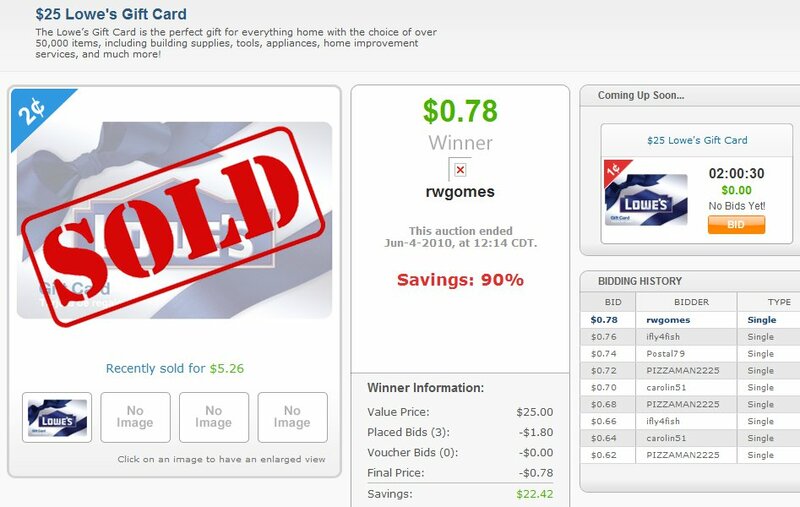 Select another item from the top and again you will find the same bidders, same bid price but product name, picture, statistics changes as of you are bidding for newly selected item. This is all framed programming and logic we have setup at back end to show price and bidders as of they are real. Also I have seen same bidders winning the big ticket items. I suppose, they have created a bot of 1000’s of users who automatically and consistent bids and wins the auction and ripping of the other legitimate bidders whose has put real bids or vouchers. I haven’t really seen a picture of someone who really won the auction and posted openly on the internet…. nor any real employee coming up and telling us it is not a scam. Secondly, google map their address and you will find it is pointing to UPS store … probably having a PO box…. how come such a big company does not have real address. Stay away from this scammers… I have asked refund today…. let see when will I get it or at all I will get it. Thanks for writing this. You are really doing a public service here! There are scores of bogus Quibid “review” sites on the internet, making it difficult for the average person to find anything that isn’t a shill posting. The FTC needs to go after Quibids, plain and simple. They are deceptive. And that’s being VERY charitable. Their ads, which appear on many mainstream media websites, are patently deceptive. As you’ve pointed out, they aren’t forthcoming about the real costs of winning their “lottery.” Let’s hope that they are shut down, their assets seized, and their operators given long-term bunks at Club Fed. This is a racket operating in plain site, on a massive scale. Quibids is a total ripoff. Just another scam business built around a loophole. People who waste their time on this garbage get nowhere in life, and the people that run it should be arrested. I registered to take a look and get more info only to see they wanted my credit card before I could see any pricing. Decided to check the blogs and found this great site that has clearly nailed this scam. There are no shortcuts to ‘success’ in anything. The very first sin in the Christian Bible supports this as it was an attempt to ‘gain infinite knowledge quickly and easily’—-with a mere bite of an apple. I’ll stick to eBay as well. HI. I took a long look at Quibids and did the one thing that nobody else seems to have done…I read the Terms of Service. What they are going to do, and how, is spelled out there in black and white. I don’t pay, win, or lose.. I just watch and have no vested interest in who comes out on top. Are there shill bidders? I don’t know. I do believe that someone comes away with a great deal but just one person and not the masses bidding. Another way to look at it, I think, is how a few people win multimillion dollar progressive slot jackpots for a few quarters. You know it happens but were you the lucky one…probably not. I would try it though so long as the “buy it not” feature is in place and the retail price wasn’t inflated but otherwise I wouldn’t. Also, for what it’s worth, if you are presidosped to gambling issues then forget about it. Join, don’t join, it’s up to you but know your limits and don’t go crazy with money you can’t afford to lose. there is anybody could do something to fund this people some how ? I was not aware the losers are also billed. What about when you are given free bids. Do those cost you anything? They have 100’s of autogenerate users to bid as real user against actual users and 99% of the time the winner is autogenerated user. In that case, they do not have to ship anything and the loosing users have lost all their bids(money). They make 100s and 1000s without selling anything. You will only win when the product is too cheap or the amount you have bet is beyond the actual price in the market. I can write simple program to set this up online. They also ship wrong products and not the one you won. Spend some time and google this scammers, you will find lots of complaints. Save your hard earned money or better donate to the needy instead of paying these scammers.